Are you Ready To Print? Many people now have the capabilities with Photoshop and other design programs to create their own files for marketing and business purposes. We are always here to help with any questions you might have and can walk you through the set up of your files. The printing process isn’t perfect, so to make sure your pieces come out looking THE BEST here are a few guidelines to follow. This is an area within the trim where any text, photos and other essential parts of your design should be kept. The final size of your piece is referred to as the trim size. All critical art should be 1/8 inch inside the crop area otherwise it will get cut off. This is where the crop marks show our bindery where to trim your pieces. This is the area outside of the trim line that will get cut off, and while it ultimately gets removed it’s still important to the overall production of your product. 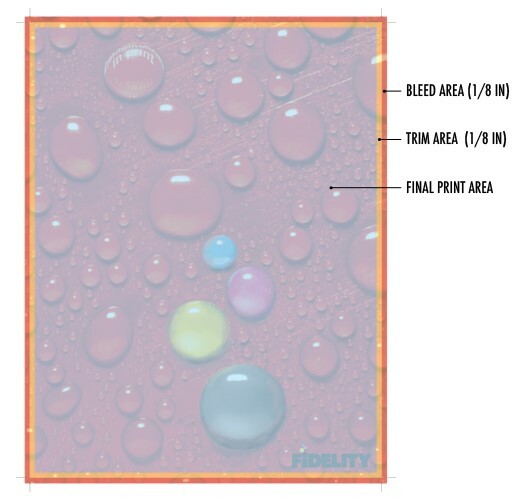 Whether you’re using a photo or a solid color, you’ll want to make sure that the background of your design extends through and fills the bleed area. This makes sure that your design reaches all the way to the end of the card when trimmed and will prevent any ugly white edges. When using photos you’ll want to make sure there is plenty of extra space around the focal point of the image, so the unimportant part of the photo can fill the bleed area and the important part is still in the safe area. We don’t want anyone’s head to get cut off. Upload single page spreads or PDF's with bleed and crop marks. All of your programs will have that option. If your design looks fuzzy on screen, or you see a low resolution warning on screen, you need to get a version with a higher resolution. Don’t hesitate to contact us about anything. Meet The Face Behind Fidelity Offset, Inc.